Hillsdale rescheduled, plus more April shows! I rescheduled my Hillsdale Library show for this Tuesday, March 27, from 10:15-11:00am. Sorry about the cancellation last week, and I hope to see you on Tuesday! 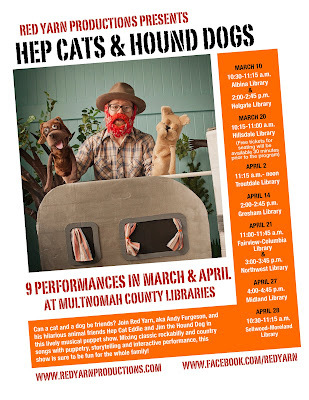 See below for the full schedule for “Hep Cats & Hound Dogs” at the libraries. Also, I have a few other shows coming up in April. At 2pm on Saturday, April 7 I’ll be performing at Picassitos, an awesome art & craft studio in Sellwood. This is the first of a few shows I’ll be doing at Picassitos in promotion of a summer day camp I’m co-leading there from July 16-20 (registration info to come). I’ll also be performing at Cafe au Play on SE Division from 10:30-11:00am each Friday in April. I’ll post a flyer for those shows soon! See my full show schedule below. Also, to register your school-age child for Puppetry and Rock Band camps I’m leading at Friendly House in NW this summer, visit the FH website. 1525 SW Sunset Blvd. Free! 2451 SW Cherry Park Rd., Troutdale, OR. Free! 5633 SE Division Street. $3/person! 8021 SE 17th Ave. $3/person! 385 NW Miller Ave., Gresham, OR. Free! 1520 NW Village St., Fairview, OR. Free! 2300 NW Thurman St. Free! 805 SE 122nd Ave. Free! 7860 SE 13th Ave. Free! http://redyarnproductions.com/wp-content/uploads/2016/04/bright-red-logo-for-web1.jpg 0 0 Red Yarn http://redyarnproductions.com/wp-content/uploads/2016/04/bright-red-logo-for-web1.jpg Red Yarn2012-03-24 11:40:002012-03-24 11:40:00Hillsdale rescheduled, plus more April shows! Boohoo! I have to cancel my show tomorrow at Hillsdale Library, as I’m stuck in Texas after thunderstorms delayed my flight back to Portland. Hopefully I can reschedule the show soon! Sorry. Presenting "Hep Cats & Hound Dogs"! Can a cat and a dog be friends? 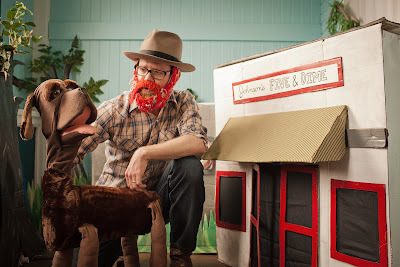 Join Red Yarn, aka Andy Furgeson, and his hilarious animal friends Hep Cat Eddie and Jim the Hound Dog in this lively musical puppet show. 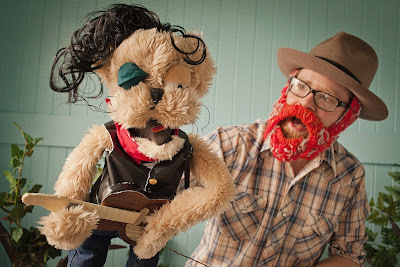 Mixing classic rockabilly and country songs with puppetry, storytelling and interactive performance, this show is sure to be fun for the whole family! All performances are free. First come first served. Generally, tickets are available 30 minutes before showtime. Photos copyright Aaron Hewitt Photography, 2012.
http://redyarnproductions.com/wp-content/uploads/2016/04/bright-red-logo-for-web1.jpg 0 0 Red Yarn http://redyarnproductions.com/wp-content/uploads/2016/04/bright-red-logo-for-web1.jpg Red Yarn2012-03-05 11:22:002012-03-05 11:22:00Presenting "Hep Cats & Hound Dogs"!